Microsoft Office is one of the most universally used suites of productivity tools in the business world. It includes Microsoft Excel, Microsoft Word, Microsoft PowerPoint and MS Project, etc. Individuals also use Microsoft Office both in their personal and professional sphere. In the fact that, knowledge of Microsoft office is one of the fundamental needs for most of the job profiles. Microsoft Certification is an industry standard that is recognized around the world. In this way, most of the company’s value Microsoft certification and consider certified specialists over the non-confirmation peers. Mostly all of us know about Microsoft functions. We are using MS Excel and MS Word on the everyday basis. But, it is significantly confined to typing letters, creating a table, changing fonts and formats and few other basic functions. Moreover, we won’t know how several formulas can be utilized for sorting a table or formatting one and more. If you want to enhance your skills and qualify as a skilled Microsoft expertise, there are various Microsoft certification programs available. Given its popularity in the corporate world, becoming Microsoft Office certified is one way you can emerge from the crowd and prove your level of proficiency. Microsoft grants three levels of Office certification. If you want to get Specialist and Expert levels of certification, you should get certified in a particular Office application, for example, MS Word or MS Excel. This certification includes a single examination. If you have obtained your Microsoft Certification, you can get to various benefits that can be found on the Microsoft Certified Professional (MCP), Microsoft Certified Trainer (MCT), and Microsoft Office Specialist (MOS). According to the Microsoft survey – by 2017, 33% of respondents experienced a pay rise post-certification, around 62% of the IT firms in the world want their employees to have Microsoft Certification, and 49% of respondents believe cloud certifications are helpful in improving employability. Here we listed some benefits and advantages of Microsoft certification. Microsoft certification builds your base on utilizing Microsoft Office efficiently; be it Microsoft Word for making documents, Microsoft PowerPoint for creating a presentation, Microsoft Project for handling projects, and Microsoft Excel for handling data. Your widespread knowledge of Microsoft programs is exhibited with Microsoft certification, and you can develop a powerful platform in IT for career prospects. If you are familiar with Microsoft programs, you will be an expert in building charts. Making charts is ideally recognized to be a responsibility for finance professionals and business analysts. But, nearly all jobs demand this skill at sometimes. In order to support any data and source, you require depending on charts. Likewise, charts are an essential component in presentations that you come across once in while in your professional life. Data in today’s world really implies something. In order to support your view or thought, you require sufficient data to put forward. At the time of such situations, Microsoft Excel is an extraordinary program to depend on. MS Excel can be utilized for comprehensive formatting and data collation. You can take many files together and sort data. Microsoft program being accessible online is a generation next big thing. You can impart your work to business leaders and stakeholders through online from everywhere. It makes work more flexible and your capacity to work Microsoft programs efficiently make you an expert at work. As already specified, certifications can be a tool to enable you to get another job. In case of somebody who is quite recently beginning, however, certifications can be particularly significant. The people who are just beginning in IT typically don’t have the experience to list on their resume. It might be conceivable to compensate for this absence of experience by enhancing a resume with Microsoft certifications. Individually confirmed skills from a trusted name in desktop applications add a globally recognized credential to applicants CV’s. Furthermore, doing your office work comfortable and effective, Microsoft certification also opens up excellent career prospects for you. You can maintain for testing leadership and analytical roles with your Microsoft certification. You can demand for salary and better positions with your expertise to fluently use the Microsoft program towards better business and success. Likewise, in many situations, this certification is essential to get a job. Microsoft Office specialist certification provides candidates with the way to upgrade their skills, prove their abilities, enhance their professional performance and develop their careers. 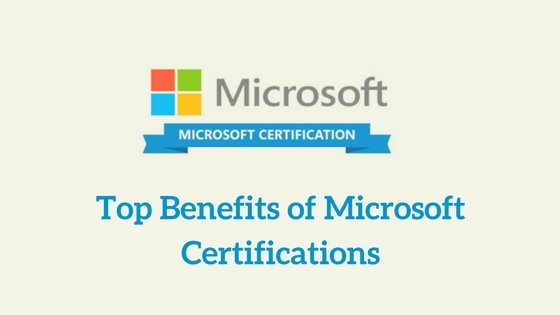 These are few of the important benefits that Microsoft Certification offers to you. Each of these pointers definitely assures that Microsoft certification is highly beneficial for overall career growth. If you need some proficient training for Microsoft certification, you can use our Microsoft Office Certification course.